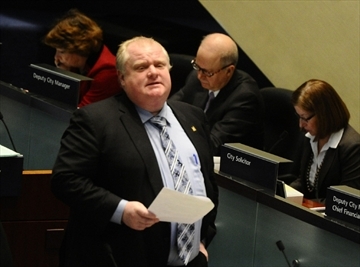 Guelph Mercury: Is Rob Ford the Socrates of our age? What do Socrates and Toronto Mayor Rob Ford have in common? While one wore a toga, and the other wears a blue suit that’s perpetually open, both were taken to court for contravening rules of the state. Both felt persecuted by people they believed were misguided. Socrates and Ford are also both known for apologies that really are not apologies. This is what’s called a non-apology apology. It’s a way to acknowledge that you were somehow caught in a screw-up, or that a screw-up had indeed occurred. But you do not take any responsibility. Indeed, you might even “deeply regret” something screwed up, but this is mainly an attempt to gain some sympathy. It’s a favourite tactic among anyone in a tight spot, including the classic “mistakes were made,” which a public relations pro might whisper into the ear to the disgraced bank chair just before he faces a committee. Ask most any married man who has tried the weasel-way defence with his partner — “hey, if you think I did something wrong, well, sorry” — and he’ll likely tell you things got pretty heated, then really chilly. This is it: unless you take responsibility, the apology is worth zip. A cynic might assume all politicians say whatever is necessary to be elected. Or that all philandering generals tell lies to keep their jobs. After all, accepting responsibility runs the risk of consequences. You could lose your job, partner, status, reputation and more. What I haven’t done is own up to them that I procrastinated about the project. And I likely haven’t admitted to myself that I made the initial commitment in haste to placate them for something else I didn’t do, and that this is a recurring pattern of behaviour. But without taking responsibility, I will lose my children’s trust. Over time, my commitments to them will have little value. What I say about most anything will likely be doubted. Ironically, if I do take responsibility, fully own that I screwed up, make a new commitment, and then follow through on that commitment, I can gain back their trust. If following through and admitting mistakes becomes the new pattern of behaviour, their trust in me will intensify. Perhaps Rob Ford could give this a whirl. It wouldn’t be like drinking hemlock to own up.